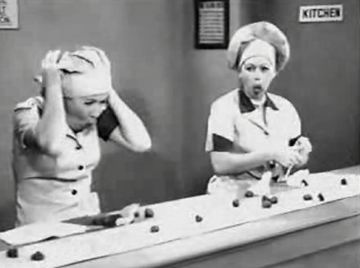 My recent prayer life resembles Lucy and Ethyl at the chocolate factory. Everything seems to be going ok between me and God, great conversation over a hot cup of coffee, how I prefer most of my conversations. He and I have a nice easy flow between each other. It’s a great analogy of the conveyor. Things come across my radar but I just keep passing them along to God to handle. Then things in life to start pick up and I’m spending less time just hanging out in His presence and more just grabbing and what He has to offer. It’s harder to keep passing because things are piling up. As the pace quickens I start to feel less and less in control and I start snatching what I think I can handle and shoving it under my hat until I can get back to it. Pretty soon I’ve lost all control and chocolate is hitting the fan. My prayers sound like frantic panicky ordered to do lists to be checked off. God, who is going to take care of the dry wall and mudding? Could you just tell me where the passenger van is coming from for Sparrow? Did you take care of the 50K in 50 days or not? God I have no idea who is going to put all the beds together. I thought by now you would have given us the people to lay the floors. Lord, what I am forgetting to ask for because it feels like I’m jumping through the wrong hoops? Who is going to get the doors hung? Why Lord, why are there little 4×4 cut out squares in the wall and ceilings? How is that ever going to be done? Is the fire escape taken care of? I’ve prayed and prayed for the staffing to be finalized Lord, what is the hold up? Licensing just feels like a complete nightmare Lord, what am I missing here? She needs a place to stay right now Lord, what I am suppose to do with that? Prayer is a conversation. That up there, is whining frustration. God can handle that but who wants to hear that? I don’t even like hearing it come out of my own mouth. So once again I’m circling back to the idea of conveyor belt. In every circumstance, I try to pray for God’s will to be done. As things come across my radar I just try keep moving them on down the line to God. My goal is just keep the belt moving to God and not let my hangups and insecurities bog down the process. My hope comes not in what I am able to accomplish but in God’s faithfulness that He will bring to completion what He has started. My hope comes in choosing joy, in trying to see every situation as a chance to stand back and watch God do His thing. My hope comes through prayer as invitation to be a part of what God is doing and trusting Him with every tiny, mundane part.